When Amy Nappa was unexpectedly diagnosed with Stage IV-B uterine cancer, her life and that of her husband's, Mike, changed forever. But they weren't the only ones whose lives were touched by Amy's courageous journey into the waiting arms of her loving Savior. What started out as a private Facebook group intended to keep family and close friends apprised of Amy's medical condition grew to include hundreds, with thousands more reading publicly about Amy daily on social media. And now, Mike wants to share those poignant posts with you, so you can come to know the amazing woman he adored for 30 years (and still does). So, this is Amy's story, mostly in her own words. It's a love story, a loss story, but most of all it's a life story. You'll quickly discover that Amy's life, especially the way she lived the end of it, will inspire your own. 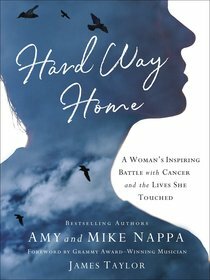 About "Hard Way Home: A Woman's Inspiring Battle With Cancer and the Lives She Touched"
Mike Nappa is the founder and Chief Literary Agent of Nappaland Literary Agency. He is an award-winning editor who has worked in book acquisitions for three prominent publishing houses. Amy Nappa is the award-winning and best-selling author of several books including "A Woman's Touch, A Heart Like His, "and "Circle of Love," with a combined total of over a million copies in print,"" She has served as a columnist for "HomeLife, Focus on the Family (Growing Years Edition)," and "FaithWorks "magazines and is a regular contributor to "Today's Christian Woman." Amy is also a sought-after women's speaker and serves as associate publisher of the free webzine for families, www.Nappaland.com. She makes her home in Colorado, where she is active in her church.